1st Example: Pairs that grow from soil. The first thing that comes to mind in this category is femininity and masculinity in plants. We will not mention about it now as we have discussed in an another work. 2nd Example: Pairs that are created from their own selves. The first thing that comes to mind in this category is the creation of humans as males and females. 3rd Example: Pairs that are created from things that we do not know. So, what is meant with the expression “pairs that are created from things that we do not know”? 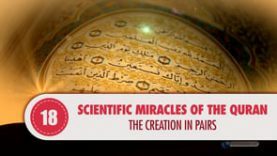 The people who lived during the revelation of the Qur’an were not aware of the most of the creation in pairs in the universe. While femininity and masculinity is the equivalence of the concept of pair, the expression of the verse “other things of which they have no knowledge” has a wider meaning. Thus, at the present time, we see one of the meanings that the verse indicates. As researches conducted on the structure of the atom has developed, it has become clear that the existent particles are not limited only to protons, neutrons and electrons and the atom has a more complex, delicate and perfect nature than we think. Creation in pairs is also valid for the smallest particles of atom. A proton has its pair; anti-proton, an electron is coupled with a positron, and a neutron possesses an anti-neutron. The creation of matter in pairs is one of the most important discoveries of physics. Paul Dirac, a British scientist, was awarded the Nobel Prize in 1933 for his discovery in this field. The discovery of Dirac is known as “Parity” and thanks to this discovery, it has been presented that the matter has a pair called anti-matter. Anti-matter bears the opposite characteristics of the matter. For example, contrary to matter, anti-matter electrons are positive and protons are negative. This fact is expressed in a scientific source as follows: every particle has its antiparticle of opposite charge. The uncertainty relation tells us that the existence and non-existence of pairs forms simultaneously everywhere and at all times. As we see, the expression of the Qur’an, “We created other things of which they have no knowledge”, is so full of wisdom and so mysterious. As Badiuzzaman Said Nursi said;“As time grows older, the Qur’an grows younger.” That is, as science develops with the progress of time, many mysteries of the Qur’an are revealed; virtually, the Qur’an grows younger. Let us see how many pairs of which we have no knowledge will be discovered and science will prostrate before the Qur’an!